My old cutting table, while very functional, wasn't as fabulous looking. I was using a folding table, sitting on paint cans for height. Remember this? Instead of building a wall of cubbies, I used the cubbies to build the island cutting table. To build this I used 4 sets of cubbies and connected them for stability using L-brackets and mending brackets. The top is just a cutting board. This is so brilliant Suzy. I expect to see it as a winning DIY idea somewhere. Seriously! That is a fabulous island! Love it! Omg omg omg omg! So exciting! You are a machine! It’s brilliant!!! Looks fantastic, clears floor space for you, and it looks like it’s a good height too, help out with tired back and all that! What a good idea…I’m impressed! amazing table! 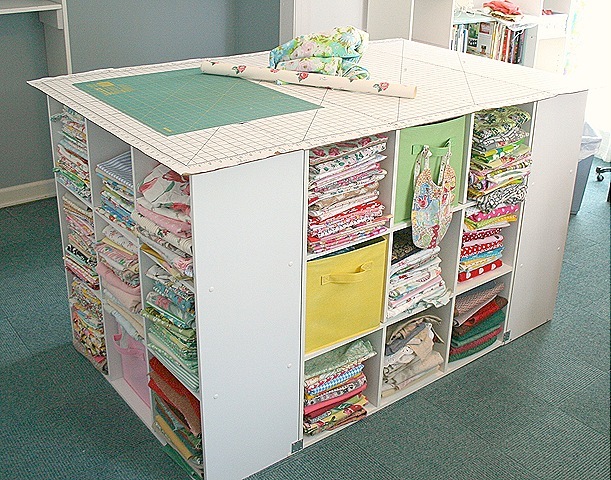 Such a great idea to have all your fabric storage underneath- love it! 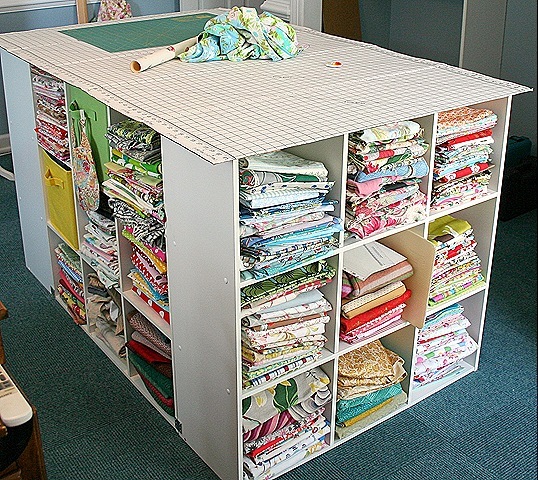 Love this, what a fun idea – great storage AND workspace, bingo! So awesome!!! What a fabulous idea!!! 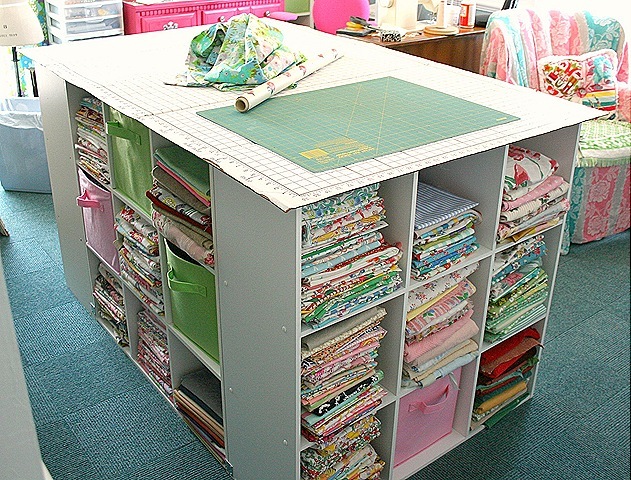 This is such a good idea and it would work for so many different crafts too. This is fabulous! I must have one! Where did you buy the cubbies? where are the cubbies from? I lovelthis. I sooooo Love this Idea. I am sooo gong to use it :), Thanks for sharing!!!!! WOW this is fabulous and then some. I would be totally inspired to create in that space!!! LOVE LOVE LOVE. 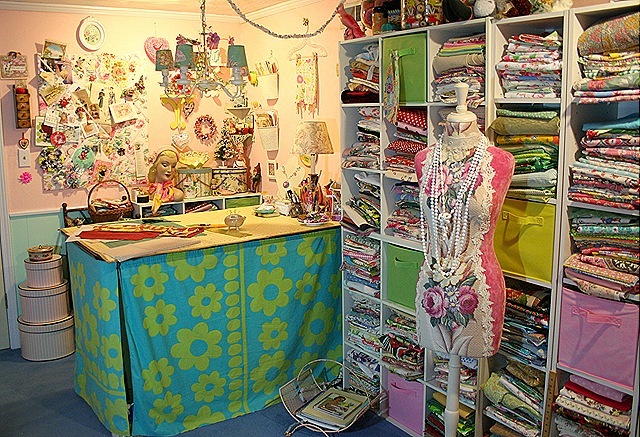 I’m in love with your new crafting center and I have needed an answer for my sewing room! LOVE! Ooooooh! I like! I like a lot! You can get the cubbies at Target- they go on sale frequently. OMG…I want this… you are so lucky!!! Awesome! I’m a scrapbooker and I’m thinking this could be a desk/scrap table if I only used three sides and put on a sturdy desktop! Then I’d have a place for my knees underneath. Another Pinterest user here… What is the cutting surface made of? Can you give us the overall dimensions as well? I love these! I am a beader and jewelry designer and am in serious need of a good, tall table. I may have to make one of these. Thanks for the great idea! I will be linking to this post on my own blog….http://molecularjewelrydesign.com ! i want to do this. One question: what is in the center section to support the middle of the cutting table? Creative! Now in my memory bank to do when we get out of this little apartment and graduate from law school. This is awesome! Great idea, and it looks beautiful!! !